On Monday August 15th, a Tibetan Buddhist monk immolated himself in protest of the Chinese policies related to Tibet, coinciding with the Chinese communist party's latest political moves. He publicly doused his body and drank petroleum while shouting, “We Tibetan people want freedom” and “long live the Dalai Lama!” Free Tibet, an organization that calls for greater Tibetan autonomy in China, identified the monk who killed himself as Tsewang Norbu, 29. This is the second such public immolation that has occurred in a heavily populated Buddhist region of western Sichuan province. Much like in Tibet, the surrounding provinces that have Tibetan populations have been prone to tensions with the Chinese authorities, most of which represent the majority Han population. The vast Himalayan region known as Tibet has long been a vital interest of the Chinese government due to its strategic location, scenic beauty and wealth of resources. However, since the Dalai Lama fled in exile in 1959, China has been sensitive to the opinions of Tibetans and the global community regarding Tibet. The Chinese government fears that the Dalai Lama is a separatist, and thus has focused much energy over the last few decades maintaining the control of Tibet and surrounding regions. The Dalai Lama, himself states that he only wants more autonomy for Tibetans. The Dalai Lama and the Tibetan government in exile are currently located in Dharamsala, India. The obvious concern regarding the monk’s immolation is the clamping down by the Chinese army. Stephanie Brigden, the director of Free Tibet said in a news release that the Nyitso monastery was cut off from Internet and phone access. The Chinese army also surrounded the monastery. This event also coincided with an important political move made by the Chinese communist party last week. The hand picked Chinese Panchen Lama was leaving Beijing for the first time, and visiting Labrang monastery, a beloved monastery of Tibetans in southern Gansu Province. He, along with his security entourage, was making a visit to study meditation in the hope of gaining popularity among the 1,000 young monks living there. The Panchen Lama, is the second highest in spiritual authority behind the Dalai Lama. Normally, the current Dalai Lama chooses the Panchen Lama. In 1995, the Panchen Lama, whose name is Gyaltsen Norbu, was appointed by Chinese authorities over a boy chosen by the exiled Dalai Lama. Gyaltsen Norbu is emerging as the Chinese Communist Party’s answer to supplant the authority of the Dalai Lama. Now 20 years old, he has begun playing an important political role for the Chinese government. As Beijing attempts to increase the acceptance of the Panchen Lama, more monasteries around Tibet will face brief military control and communication interruptions. China has claimed Tibet for centuries and has long been a source of tension. 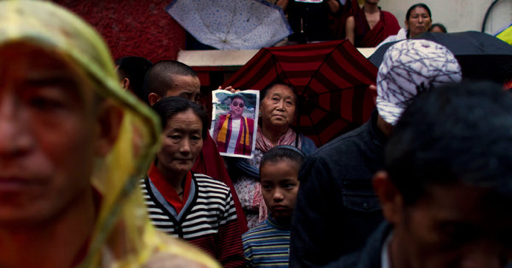 As the current government aims to gain political authority by way of the Panchen Lama, still more monks and international organizations protest their actions. However, as communicative technology becomes more widely used in places like Tibet, the Chinese government may need to change its political goals regarding Tibetan autonomy.